As one of the programmers on Uncharted: Drake’s Fortune I’d like to give you some insight into the development process in creating the game’s characters. We are a very small team creating the enemies here at Naughty Dog. Therefore we needed to be smart about how we approach creating the characters and deciding where to spend our time. We have some very talented animators here and that was something we wanted to leverage when trying to make the characters come to life. The final AI in Uncharted is simple, yet also very powerful. We are heavily utilizing the Cell architecture to allow the enemies to be more aware of their surroundings. On top of this, the AI is highly configurable to allow the designers to create custom behaviors. Examples of this are combat distance used for close-combat/ranged enemies, likelihood of moving and reaction times, grenade throwing and shooting styles. The goal was to make the AI ‘seem’ smart. If we could do so without making the code complex, that would be great. The approach we took to this was to use animations to add variations to our characters instead of trying to programmatically add complex behaviors. Halfway through development of Uncharted I sat down with the animator for the enemies (yes, only one animator) and played the game. We wanted to see what the player sees the enemies do the most because those would be the areas in which we wanted to focus our energy. We found that enemies getting hit and dying made up a large portion, and a fun one. Other areas were enemies entering combat, attacking from cover positions and, what we call, open combat – enemies standing in the open shooting at you. Knowing this, we went to work. We wanted to give the player a rich experience by being selective in which areas to add variety. I’m pleased to say that the main enemies, pirates and mercenaries, have hundreds of animation variations in these areas. All of this makes the game experience richer and avoids repetition. This, together with endless hours of fine tuning, resulted in the smooth and believable characters in Uncharted. Right now we are in the process of making the final disc. Pretty much everyone is playing the game – not because we have to, but because we want to. People are trying to find all the treasures in the game or beat it on every difficulty level, which is not an easy task. I find it amazing that after working on the game for this long we all still really enjoy getting immersed in the story of Uncharted. I hope you all will enjoy Uncharted: Drake’s Fortune as much as we do. Nice! It is cool to see how passionate you are about your art–keep it up! This game is gonna be great! I know that I am going to enjoy Uncharted as much if not more than you guys do. I am buying this on day one and I can’t wait for november 20th to finally come. Once again, I’m proud to own a PS3 because of titles like Uncharted. When the game is going to be master gold ? MAYBE IT IS TOO LATE TO DO THE CHANGES, BUT JUST WANT TO SAY THAT THE LOOK OF THE EXPLOSIONS IN THE BETA DISTRIBUTED TO THE PRESS ( IGN, 1UP ETC. ) IS REALLY BAD. KEEP THE SAME EXPLOSION LOOK AS THE E3 2007 TRAILER ! I REALLY DON’T LIKE THE MUSHROOM TYPE OF EXPLOSION. I can’t wait for Uncharted! You guys at naughty dog just keep teasing us! Closing the year out the right way in 2007 for the PS3. Of course 2008 looks to be simply stunning with AAA exclusive releases. Thank You Christain G. …..& all….Naughty Dogs. And so very fine a thing it is too . Absolutely Brilliant Production ! !! About the water in Uncharted. Thanks for the update, I look forward to buying your game. Glad to see you’re reaching out to the community in this fashion, it’s really appreciated by consumers like myself. A question: What about non-pirate/mercenary enemies? Looks great, and it’s nice to see a team so into a project. Thanks again (and again and again) for adding 1080 support. Well… all characters in the game have been developed in the way described above where we played the game and added animation and AI variation where the player would see it the most. This holds true for the non-pirate/mercenaries as well as the friendly characters. 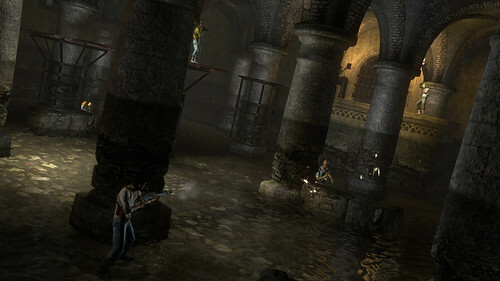 As to the comments on the Cell architecture used, can you comment on how many of the SPU’s were used in Uncharted (enemy AI and in total) and what you felt was the % of power harnessed for Uncharted? I mean honestly as long as the game is fun and can keep you entertained who cares if it uses every SPU or all 100% or even 10% of the PS3’s power. Did you get the system to play the games coming out for it or to nit pick everything to death and not enjoy gaming? Personally I think Uncharted will give me an Indiana Jones character and feel with the story and play of the game and I can’t wait and am glad that the animations will be unique enough experince everytime we kill one. wow. you are reading more into my question than I intended. I will always take a fun game over tech. specs. anyday, which explains why I am into console gaming for one thing over say, PC gaming. I already have Uncharted on pre-order.. why can’t I be interested in how much of the PS3 architecture was utilized for this first Naughty Dog release? I like to imagine how the games in the next 5 years may look and play given what is released today. My apologies for asking… and wondering! I love the amount of work you guys and gals have put into Uncharted. This is a must buy title for any PS3 owner. Is there a collectors edition? I cannot freaking wait to play your game. Sony is extremely lucky to have you guys as developers. ND will e the first one to truly show the potential of the PS3. I’ll get my one worry out of the way (day one purchase of course, but): while you say you’ve put a lot of effort into the animation of the enemies, in all the videos I’ve seen, there’s not a lot of variety among the look of the enemies. The pirates all look the same, the mercenaries all look the same. Is that just due to the videos being of early builds or is Drake really going to be shooting the same two bad guys a hundred times over? the success of the PS3 is hinged on developers finally being able to control the Cell and it’s SPU’s- so they can be free to make the games enjoyable! Is the game still on schedule for a November 20th launch? We are utilizing all SPUs in Uncharted for AI, animation and lots of other systems. We are however just starting to tap into the power of the Cell. In future games I can promise even more utilization of the Cell which will result in more of everything, including game play. In regards to pirates and mercenaries all looking the same, it might be due to that particular section of a level. There is a nice variety of looks for the enemies which will show more and more as you get further into the game. As far as I am aware there is unfortunately no collectors edition. The game is still scheduled for November 20th in the US and Dec 6th I believe in Europe. Congrats to Team ND who, along with Insomniac, are ready to give us all an amazing 1-2-punch of good games this season! Christian and all the Naughty Dogs – You guys rock! Looking forward to play Uncharted soon. According to EGM, it won’t have support for the Trophies in Home, but there will be themed environments of Uncharted, as well as costumes. It was the November issue on EGM. @ Christian, thanks for the reply on SPU usage. I think Uncharted is one of the better looking games out for the PS3 and other systems right now, and I can’t wait to play my copy on 11/20 as well as check out what other games Naughty Dog will be releasing in the future! @Christian, thanks for your reply, looking forward to this game, and even more so the new games you will be making with your new knowledge of the Cell.. So once a developer cuts his or her teeth on the Cell, do you guys then share that info with Sony and other Developers? Or do you keep it in house? Just wondering, it seems like someone should write a “Cell Programming Architecture for Dummies” and distribute it to all the other developers who are saying the PS3 is too hard to develop for.. Thanks again for your responses and looking forward to November 20th! Sooo, the disc is being finalised. This probably means a big “Has gone GOLD” party at Naughty Dog. When do you think you will hit master gold ? All PS3 developers have access to the PS3 development network. There we have forums where we share findings and solutions. Also, there will be quite a few Naughty Dog people giving talks at next years Game Developers Conference to further communicate the solutions used to develop Uncharted. We went ‘gold’ last week. Right now the game is in other words 100% done and is currently going through the approval process. I know some developer’s can test how much of the PS3’s power they’re using… Do you guys have at least a rough idea of how much power of the PS3 your using with Uncharted? Anyway, I’m very eager to see how all the animations will look and play out. In some videos I can already see a few different ones at work. Yeaaahhhhh ! The game is GOLD ! Hoping to play the demo soon on PSN. We have some pretty sophisticated tools that give us detailed information about the amount of ‘PS3 power’ we are using. We have been using this data to make Uncharted what it is today. However, for every day that goes by we get a better understanding of the platform which will make the next game incredibly exciting to work on. I’m already very excited. Can you give us a clear answer whether yes or no the look of the explosions is always the same aka mushroom type of explosion or micro atomic explosion ? jak is next i hope!!!!!! you no it is dont lie!!!!! Do you have any hint to give us as to know when we are going to have the demo on PSN ? I have been avioding this game. Cause I want to play it. You guys seem like you have shown too much already. The stuff up on the PSN. Is that stuff part of the unlockables in the game. Cause they did that with Heavenly Sword. Which was pretty cheep if you ask me. The explosion effects have they been update because The water around it doesn’t move. wow, it really sounds amazing, everytime i read something like this, i’m impressed, can’t wait for the demo, or even better, the final release! Good job Naughty Dog, you make great genre’s with Crash Bandicoot and the Jak series. I hope for the best for the Uncharted Series. I’ll be picking this title up in the first week. November’s gonna be a busy month with Haze, and Assassins Creed, along with this title. I’ll be jam packed playing these great titles most of the holidays. If you could Christian answer if we’ll be seeing a demo of this game in the PS Store? This game is Gold now? Mark me as being happy. Uncharted is coming, and I can’t wait. I hope we get an Uncharted demo soon! :D Naughty Dog, ya’ll rock! All I gotta say is thanks for making a game that has vivid colors and none of that black, brown, and grey colored game style. From what I have been seeing from this game it’s going to be a hit. I can’t wait to see what else you guys have in store for PS3. this is gonna be too awesome for words and all the 360 fanboys will be crying “cmon naughty dog, we want uncharted”, thats when us ps3 owners can point and laugh.